Analyze your thoughts and structure them with SimpleMind. The unique free lay-out allows you to organize your ideas exactly how you want it. Multiple Mind Maps on one page. Horizontal, Vertical, Top-down and List Auto layout, perfect for brainstorming. Virtually unlimited page size and number of elements. 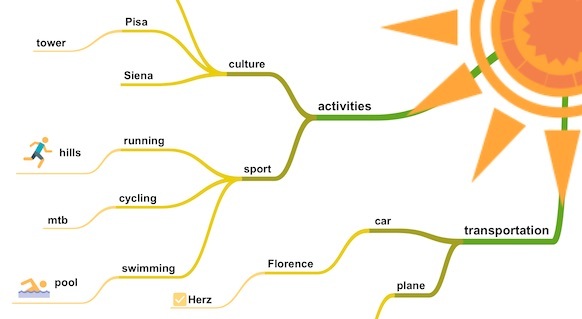 A picture is worth a thousand words, add images to your Mind Map! Add video recordings to topics (available on tablets and phones). Add voice memo’s (available on tablets and phones). Ready to show your ideas to the world? I’m growing increasingly dependent upon SimpleMind! I’m using it regularly for my writing, planning, presentations, and teaching. Outstanding software I use SimpleMind since 4 years now. Both on my android devices and PC. 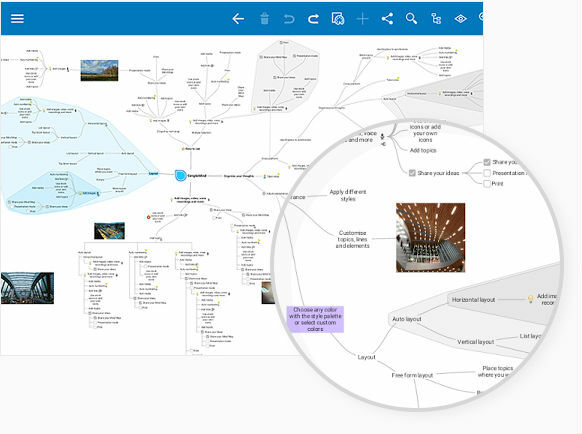 Before stumbling upon SimpleMind I've tested dozens of other mindmaps apps and without doubt this is best one. Yes, the free version is great… but the power of this tool is found in the paid version. It’s worth every penny. I use SimpleMind to study with. Breaking down chapters of text by using the hyperlink capacity in the paid version allows me to dig deeper into my understanding of the relationship of ideas.